BBC News - Spring has sprung but where are all the daffodils? Spring has sprung but where are all the daffodils? Bright yellow daffodils growing by the roadside are a welcome sight at this time of year, signalling the end of the bleak winter months and the start of spring. But this year, the extreme cold weather has delayed England's daffodil season by up to four weeks, causing a shortage of the flowers. And as Mother's Day approaches, a prime selling time for growers, farmers and suppliers fear they will miss out on profits. Mike Mann, production director for Winchester Growers Ltd, based in Penzance, Cornwall, said he expected the firm's crop to be down by 50% this week compared to the same period in previous years. "We are anticipating less than half of the daffodils being available from our own crop than we would normally expect in Mother's (Day) week," he said. "There will be plenty of flowers for people to buy - there won't be a shortage of flowers on Mother's Day. "What there won't be is as many daffodils out there as what we would normally see." About half of the daffodils grown in the UK are exported abroad, with the other half sold in Britain. Lincolnshire and Cornwall are England's main daffodil-growing areas. In Cornwall, which traditionally experiences a milder climate to Lincolnshire, the season can start in early January. Lincolnshire's daffodils are a few weeks behind, with many growers starting to pick their flowers at the beginning of February. 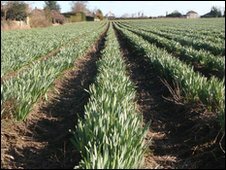 Naylor Farms, near Spalding, Lincolnshire, has only just begun picking daffodils - four weeks later than usual. Simon Naylor, whose family has run the vegetable-growing business for more than 80 years, said the firm could now see a 30% to 40% loss in sales. He said: "The effect on all of us growers in Cornwall and Lincolnshire is that we have now got a shorter space of time to harvest and sell the crop. "The market has got to take more flowers in a shorter time." If growers cannot pick and sell all of the flowers during the remainder of the season, which usually ends in April, many will go to waste. The length of the daffodil stem is also a worry for producers. The crops will now grow in longer daylight hours, meaning they are likely to flower quicker, which may result in shorter stems. Mr Mann, from Winchester Growers Ltd, said: "The question is then, will people buy daffodils that are perhaps a little shorter than usual?" With 1,400 acres of daffodil fields, Winchester Growers Ltd is one of the biggest daffodil growers in the country, producing about £150m stems per season. The company supplies direct to three of the UK's leading supermarkets, as well as exporting abroad. Many growers are tied in to contracts with UK retailers many months before the season is due to start, meaning prices are fixed in advance. New Generation Daffodils near Camborne in Cornwall has 400 acres of daffodils and is two weeks behind. 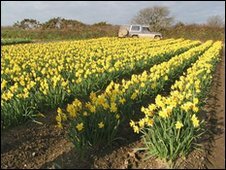 Mark Vandervlie, managing director for New Generation Daffodils near Camborne in Cornwall, said: "Growers are trying to honour their contracts but it's not a magician's job. "We cannot make them grow." He said many supermarkets set their daffodil promotions months in advance without knowing how many are going to be available, putting more pressure on growers during a shortage. Mr Vandervlie said: "Because it's so weather dependant and there is no way of changing the weather, we are finding the supermarkets are going on promotion when there is still a shortage of product." He said more cooperation between retailers and growers was needed. Temperatures have started warm up and business is improving, with many growers remaining optimistic that the season can be salvaged. "At the moment there is genuinely still all to play for in the 2010 season," Mr Mann added. "So much really depends on when the wave of flowers comes, if we can pick them and if we can sell them."